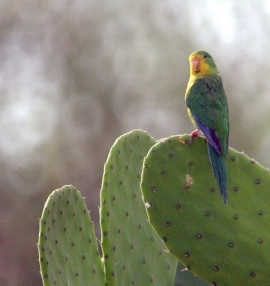 The Mountain Parakeet lives at high altitudes, up to 11,500ft. P.a. aurifrons: Male-mainly green in colour; yellow face, throat, and sides of breast; emerald green cheeks; strong yellow wash on lower breast and upper abdomen; blue outer webs of primary feathers. Bill horn in colour. Eye brown. Female-yellow on forehead and lores absent. P.a. robertsi: Male-darker green underparts, omitting chin and throat, yellow wash absent; bright yellow chin and throat. Female-as in aurifrons, but underparts darker green. P.a. margaritae: Both adults as in female aurifrons. Larger in size; shorter tail. Bill horn coloured in male, dusky grey in female. P.a. rubrirostris: Both adults as in margaritae, but darker green head and underparts, tinted with blue. Bill pink/buff in male, dusky grey in female. P.a. aurifrons: As in adult female, but with shorter tail. Calls are described as weak and piping; also a high-pitched twittering. Some notes rolling. Needs hiding places so provide boxes and foliage where birds can disappear from view. Provide cage or aviary, indoors (if warm) or outdoors, minimum length 1.2m (4 ft). Small seed mix such as: canary, millet and smaller amounts of oats, buckwheat, safflower and a little hemp; limited sunflower seed; spray millet; green leaves such as: Swiss chard, lettuce, sowthistle, dandelion, chickweed; and seeding grasses; rearing food made from: hardboiled egg, wholegrain bread and carrot, all ground to crumbly consistency; fruits such as: apple, pear, banana, mango, cactus fruit, papaya, kiwi, pomegranate; complete kibble; calcium and vitamin D3 supplements. Provide much foliage for birds to fly in and out of; provide places to hide and bathe. Not vigorous chewers. Provide unsprayed flowering branches for the buds. Vertical box 8" x 8" x 32" (20.3cm x 20.3 x 81.3cm). P.a. robertsi: Rio Maranon valley, NW Peru. P.a. margaritae: S Peru, CW Bolivia and N Chile to NW Argentina. P.a. rubrirostris: NW Argentina and C Chile. Found up to 3500m (11,480 ft) in shrubby and wooded habitats including riparian thickets and thorny scrub, mist vegetation in coastal W Peru and open grasslands with scattered bushes and cacti on puna; also agricultural areas, plantations and urban gardens and parks. Feeds on buds, seeds, legumes and berries. Social; searches for food in bushes and on the ground. Nests in crevices or holes in rocky outcrops or high banks. 5 broadly elliptical eggs, 28.5 x 20.0mm (1.1 x 0.8 in). October-December, N Chile; February-March, Argentina.